Capture and store information, then find it fast! Eye-catching, but are people interested in it because it’s free, rather than compelling? You may have heard of Evernote on the Mac blogosphere. It has just been launched for the Mac OS, after being available for a few years on Windows. 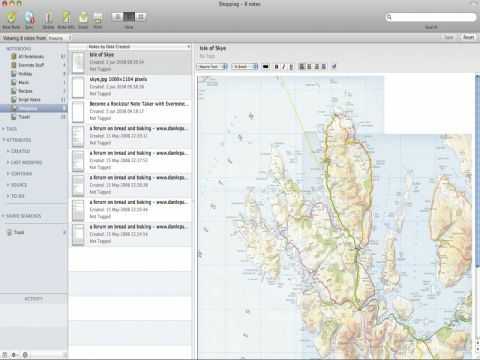 It's a simple journal and database tool that syncs your phone and Mac over the web. You use Evernote to record information on-the-fly as you go through your day, and drop it into the database from either source. This database is mainly viewed on your Mac but is mirrored online for viewing on your phone. Something captured by your phone, for example, is synced back on your Mac, and vice versa. The software on your Mac adds OS level support for Evernote, so in any app, if you see something you want to note, just select it and send it to the app. Where Evernote gets clever is its use of OCR technology for searching the database. If you took a photo of a street sign and dropped it into Evernote, you could find it again by tapping "Baker Street", for example, into the search engine. Evernote scans the images for pixels that match the text. It's brilliant, and lets you take searchable snapshots of receipts and business cards. Evernote is free, but there are limits. The options are 40MB of storage for free and acceptable OCR support, or $5 for 500MB with better OCR and added security features. Lots of people are using the free version, and we found it robust and easy to use. We did, however, struggle to find practical value. Perhaps it will grow on us. The entry methods are smooth enough. The organisation of the files into folders called 'notebooks' is clean too, but what we had difficulty with was remembering to constantly paste snippets of media and info into a database.